Senior North Korean and U.S. envoys held hourslong talks in Hanoi on Friday as part of the home-stretch preparations for another summit between the leaders of the Korean War foes. The negotiations on the summit agenda came as Washington said that freezing all of Pyongyang’s weapons of mass destruction (WMD) programs and delivery systems will be a priority at the second summit between North Korean leader Kim Jong-un and President Donald Trump, slated for Feb. 27-28. 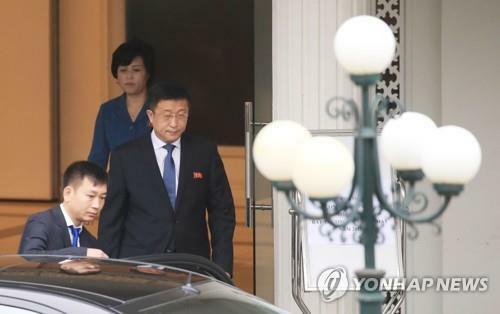 Kim Hyok-chol, Pyongyang’s special representative for Washington, left the Vietnamese government’s guesthouse at around 8:50 a.m. (local time). He was accompanied by two other officials: Kim Song-hye, director of the United Front Department’s tactical office, and Choe Kang-il, acting director-general for the foreign ministry’s North American affairs. Their sedan arrived at Hotel du Parc in downtown Hanoi, where Stephen Biegun, the U.S. envoy for North Korea, is staying, about 10 minutes later. The North Koreans returned to the guesthouse at around 2:40 p.m., suggesting the discussions lasted up to five and half hours. Three hours later, the two sides met again the hotel and had talks for about two hours. The lengthy negotiations followed their four and a half hours of talks the previous day to map out a deal that will be finalized at the Trump-Kim summit. In Washington, a senior official provided media with some more details of what the U.S. wants. Speaking to reporters in Washington D.C. in a conference call, the Trump administration official said that a priority is to freeze Pyongyang’s nuclear and missile capabilities, while its “ultimate and overriding” goal is the denuclearization of the communist nation. The official also said that developing a “shared understanding of what denuclearization is” and putting together a roadmap for denuclearization will also be key issues. He stressed a full inventory of Pyongyang’s nuclear arsenal would be required, albeit not immediately. The remarks came amid growing concern that Trump might have lowered his expectations on what he could achieve in his controversial top-down approach toward Pyongyang. Some South Korean media have raised the possibility of a “small deal” from the summit that’s intended to freeze Pyongyang’s nuclear program and eliminate its intercontinental ballistic missiles. Indeed, there’s no common definition of denuclearization. For the U.S., denuclearization means getting rid of the secretive communist nation’s nuclear arsenal. But the North apparently wants mutual disarmament, in which the U.S. would pull down its nuclear umbrella for South Korea, including halts to the deployment of nuclear-powered strategic assets to the peninsula. In a separate television interview in the U.S. capital, Secretary of State Mike Pompeo reiterated that the important task is to reduce military threats to American people. “To keep the American people safe, we have to reduce the threat from a nuclear-armed North Korea, and then in turn we can work on peace and security on the peninsula and a brighter future for the North Korean people,” he told NBC. 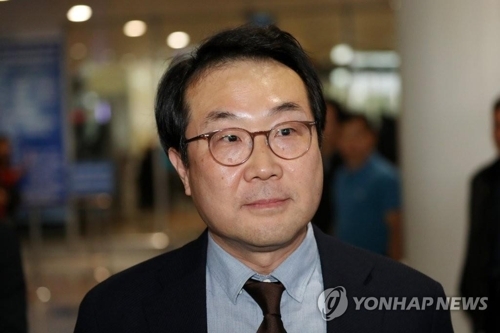 Amid speculation that South Korea may be sidelined in related negotiations, South Korea’s chief nuclear envoy, Lee Do-hoon, visited Hanoi on Friday for consultations with Biegun to coordinate a negotiation strategy. Upon arrival at the Hanoi international airport, he did not disclose details of his schedule. “It’s difficult to tell (you) about a specific schedule with the United States,” he said. He expressed hope that Biegun’s negotiations with North Korea will be successful to help the upcoming summit produce good results. Japan’s leading nuclear envoy, Kenji Kanasugi, also headed to Hanoi earlier in the day, according to Kyodo News. Meanwhile, a North Korean team, led by Kim Chang-son, an official at the State Affairs Commission, has been crisscrossing the city, apparently to make a decision on the leader’s itinerary, lodging and the summit location. The team is also reportedly in contact with a group of U.S. officials headed by Daniel Walsh, a White House adviser, to fine-tune the details of the leaders’ joint photo-ops and other public appearances, such as the timing of handshakes between Kim and Trump and the angle of cameras. Also to be determined is when and how Kim Jong-un will travel to Hanoi. The relatively young man may reportedly use overland transportation from Pyongyang. He flew to Singapore in June last year for the first encounter with Trump on a rented Chinese plane. The Chinese border city of Dandong, a gateway for North Korea’s transport, may be gearing up for the passage of Kim’s special train. If Kim chooses a train trip, it would take a few days for him to reach Hanoi, versus several hours by flight. 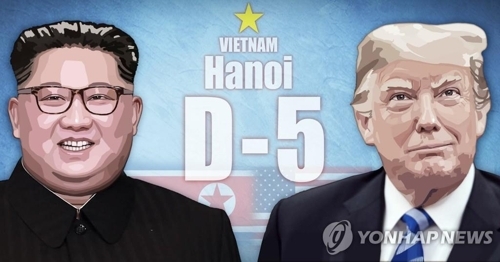 He’s widely expected to arrive in Hanoi on Monday or Tuesday amid the strong possibility that he will meet with Vietnamese leaders ahead of his summit with Trump.